A good friend of ours, Ivan, demonstrated some fine hunting skills this year in Wyoming. We asked him to write a story for our blog which he was kind enough to do. Congrats Ivan, great story, great adventure, and even greater hunting! 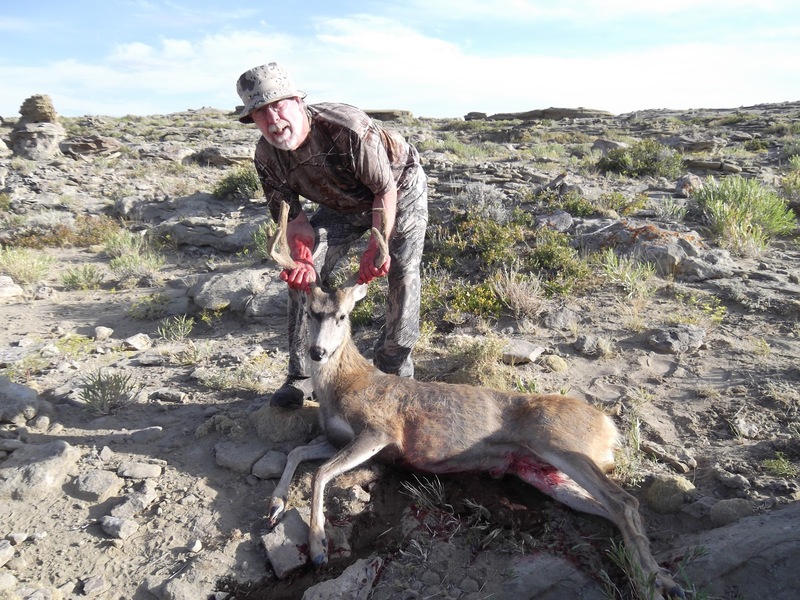 Ivan used a Wapiti "Rick Duggan 28 Special" and a STOS broadhead on his hunt. A couple of years ago a friend had invited me to hunt mule deer on his Wyoming ranch. We would be just a hop, skip and three jumps from Riverton. It only took two years to draw the tag. I headed to Wyoming in early September, sandwiching the mule deer hunt between my own Colorado elk hunting and helping out with a friend's Colorado moose hunt. The first evening John gave me a tour of the ranch which consisted of irrigated alfalfa fields, creosote bush, sagebrush, winter pasture, and rough sandstone hills. The first several days I focused on some irrigated alfalfa fields being utilized by quite a few does. I was able to glass does and bucks every morning and evening, though often on neighboring ranches. Stalking conditions were difficult in the open fields. Glassing the winter pasture proved unrewarding due to the height of the cover. After spending quite a bit of time glassing, while perched in the sandstone bluffs, I finally decided to concentrate on the alfalfa fields. I slowly moved westward through the morning, giving a thorough glassing from each promontory. By noon I had reached the western boundary of the ranch. Having not brought my lunch and nearly exhausting my water supply, I turned to work back towards my embarking point. Almost immediately I saw two small bucks feeding a half mile to the east. Having no appreciable cover for the first several hundred yards, I remained motionless glassing the bucks. A half hour later they bedded in a stalkable location, my hunt began! A cliff to their right prevented me from approaching their downwind side. Therefore I had to pass low, about 150 yards to the north, and in front of them. That would enable me to circle far enough upwind so as not to be detected. Then I would have to circle again to their south in order to approach from downwind. By the time I had this figured out and placed myself in front of them they had resumed feeding. I was able to stay low enough to take advantage of the undulating sandstone rocks. Their racks were in view but they could not see me. By now they were standing in the shade of a rock with a concave north face. I had to lose sight of them as I circled far upwind and around to their southeast. I started to approach what I thought was the rock providing them shade. The last 30 yards of the stalk included 20 yards of crunchy gravel and then a 10 yard climb up the rock which shaded them. Having not seen the bucks for some time, I slowly climbed the rock, glancing in a 180 degree swath to pick them up should they have moved. ­Nearing the crest of the rock, I saw their antlers, but 20 yards to the west underneath a different rock. From this position they would see me before I had a clear shot on their vitals. I had to backtrack the 30 yards, shift over 20 yards, and again cross the crunchy gravel and climb up the correct rock. As I came up to the top of the correct rock, the toes of my boots were directly over the shoulder of the larger of the buck, his antlers just inches below the rock I was standing on. The smaller buck was about four yards to my left. I did not want to shoot straight down, unless I made a spine shot I would probably only get one lung. I was not willing to take that chance. I waited motionless for something to happen. Though it seemed like a long time, it was probably only seconds before the smaller buck started to spook. This alarmed the larger buck. The half tension in my bow string easily translated to full draw as the bucks spooked. I swung up in one fluid motion, the arrow was released at three yards on the running buck. This is a shot that I could confidently take with my recurve, but would have passed if shooting a compound. The arrow entered high on the buck’s left side taking out both lungs at it traversed down and forward. At 70 yards the buck’s rear legs began to buckle, 10 yards more and he was down, it all happened in mere seconds. It was a small 3X4, not a buck that some would get excited about. But the memory of my first stalk, let alone to point-blank range, will last me a lifetime. Thanks to my friend John for inviting me to hunt his ranch and for putting me up in their beautiful ranch house that he built himself, and to his son for helping me carry the deer off of the sandstone bluffs.